(a) To update the Resource Names/ID, Budgeted Units, Max Units/Time and Resource Type which already have in existing project. (b) To add Resource Names/ID, Budged units, Max Units/Time and Resource type for the new activities do not have resources and budgeted unit. In order to facilitate the process of importing resources, you need to define necessary resources in Resource dictionary. Activity resources that you are trying to import to P6 should be available in the Resource dictionary. As default, there are 6 activity resource columns in Resource dictionary; Resource ID, Resource Name, Resource Type, Unit of Measure, Primary Role, Default units/time. 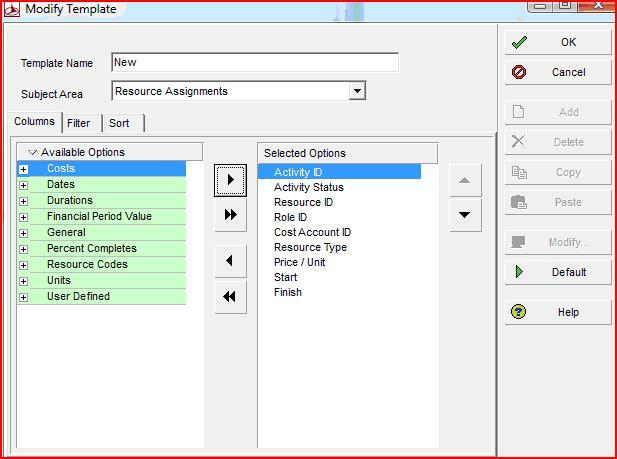 Remember to change the Resource Type to Materials when you want to create materials resource and change the Resource Type to Nonlabor when you assign equipment or machinery resources as the Resource Type is always equivalent to Labor as default. Before attempt to export/import budgeted unit for activity resource, remember to set the Unit of Time in the user preferences. This is to avoid unnecessary rework. If you intend to import man-day unit, then set to the day from the Unit of Time drop down list in User Preferences setting. If you want to import man hour unit, then select the hours. You will find it under, “Edit” then “User Preferences”. Select the Hour, day, Week, etc from the Unit of Time drop down list in the Time Units tag. Open the project you intend to export/import. 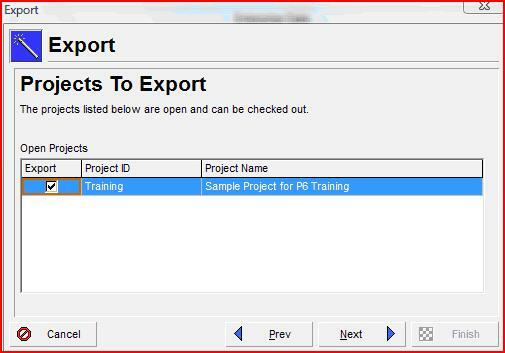 After selecting Next, Projects To Export window will appear and place a check mark to Export. 4. Add new template if there is no template available. Modify the template if existing template is available. As default 9 column data is available as shown in figure below. 5. Give the template name that you made changes according to requirement and that will help you to reduce the rework when you want to export the same data in future. 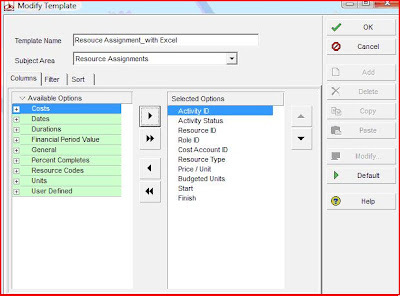 In this case, Budgeted Units column is added from the Available Options in order to import the new budgeted quantity (budgeted unit) for each activity resource. See figure below. 6. Then, select Next after completing the template. Select the location and give the file name in order to save the exported file. 7. Suppose the exported excel file is as below. Select TASKRSRC worksheet to update budgeted units. As I stated in the earlier post, the following tips should be consider before attempt to import to P6. The database field names where the data are in the first row of spreadsheet must not be modified. In this case, task_id, TASK__status_code, rsrc_id, role_id, acct_id, rsrc_type, cost_per_qty, target_qty, start_date, end_date, 'delete_record_flag as shown in above figure. Activity ID should not be changed otherwise existing activities can not be imported. Some of the column heading containing (*) sign must not be changed. RSRC and USERDATA sheet must not be deleted. 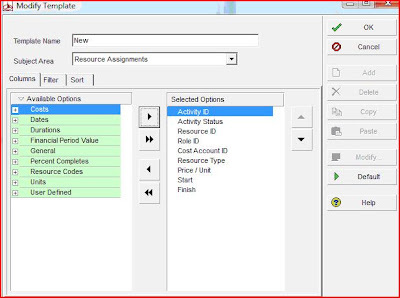 Import Type window will appear in order to select Resource and Resource Assignments. Select the Project in Import Project Options. You can select the opened project only. Hence you must open the project that you try to import. And then click Next and Finish. Remember to check the budgeted labor unit, budgeted non labor unit so that you can compare the data after imported back. I am having the problem with importing Man-hours from excel to P6. This is very useful lesson for me. Thank you... waiting for the next lessons. I could not find my cost budget. only the units. If the existing activity already has Resources allocated to it how can you import New resouces to the activity and replace the existing resources with your new ones? I have a set of roles and assigned them their resources. Now my problem is that when I import my resources with their Roles ID , primavera doesn't import the right role. Primavera does not know the ID as the string shown above. I mean if I ipmort the data with whole string it is not understood by P6. The only way p6 reads your role when importing is if you only put the very last two digits which in this case it might confuse the roles because your last two digits could be identical for couple of your roles. really Thanks so much for this, it solved for me a lot of time & energy.